Louis Babin is a French-Canadian composer. His compositions are played on this disc by the Moravian Philharmonic Orchestra conducted by Petr Vronsky. There are no shortcomings here, the Czech musicians are totally inside his music. 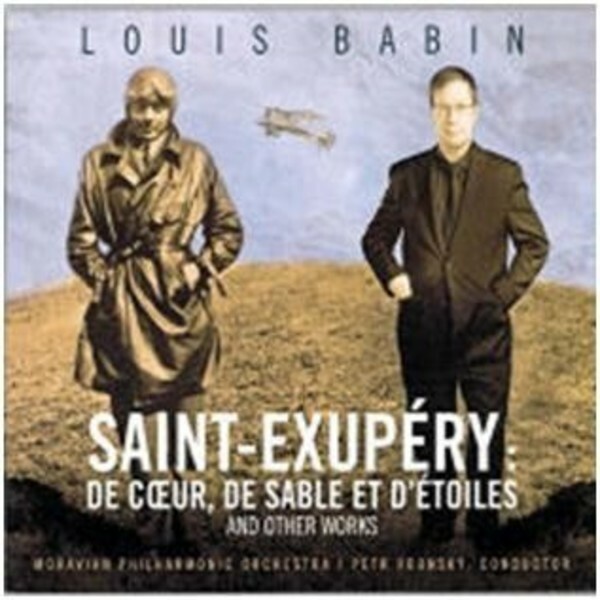 The major work is Louis Babin's symphonic poem - De Coeur, De Sable et D'etoiles - about the pioneer aviator, and author of The Little Prince - Antoine de Saint-Exupery (1900-1944). Louis Babin employs a large orchestra, using bright musical colours. The two other works on the disc - Couleurs and La Suite du promeneur are for strings and remember a time of youth, and ponder thoughts on mankind's limited years here on earth. Louis Babin is a composer with a point of view and musical vision, and his orchestral works on this disc prove that he is a Contemporary composer who knows how to write for the orchestra. Purchasing this disc supports the Antoine de Saint-Exupery Foundation for the education of disadvantaged youths.